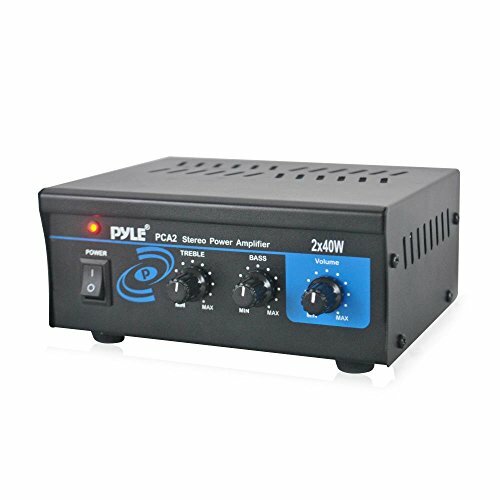 The PCA2 mini stereo power amplifier from Pyle provides up to 40W of power on each channel at 4 Ohms. Connect your inputs using the RCA jacks, and output an amplified audio signal over standard speaker push jacks. It's compatible with any audio or computer device--you can even hook up an iPod using a 3.5mm to RCA jack converter. A master volume control on the front lets you adjust the gain, and treble, bass, and volume controls on the front let you tweak your sound to exactly how you want it. The PCA2 runs on 110V or 220V with a voltage selector switch.